Who knew animals needed hearing protection? We certainly did not...that is until our customers told us their animals need ear plugs! Horses need ear plugs when they are being ridden in ride-and-shoot competitions, when they are used in horseback hunting venues, and we are told that dressage riders find that horse ear plugs help their beloved horses maintain the high level concentration that is central to success in this demanding sport. If you have a skittish horse that gets spooked by noise, give ear plugs a try. Dogs need ear protection for even more reasons. 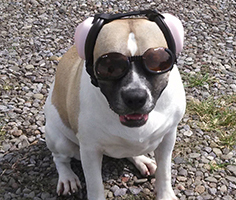 Though we do not yet have ear plugs for dogs, we do offer Mutt Muffs dog ear muffs which were invented by Michele and her partner to help her dog deal with the high level noise present in a private airplane. Her thinking was, pilots have hearing protection, so why not her pet? The result was Muff Muffs. Mutt Muffs dog ear muffs come in sizes to fit most dogs, and they are used today by pilots, canine corps police and military, hunters who use retriever dogs, and lots of dog owners whose pets find fireworks and thunderstorms distressing. Tip: if your dog needs help during the usual fireworks or loud storm seasons, be sure to order early. We get really slammed with orders around these times, and the manufacturers sometimes cannot keep up! Often requested -- we finally have horse ear plugs available! These great ear plugs are designed exclusively for our equine companions to help keep distracting or disturbing noises from causing them to shy or lose focus (especially during competitions).